‘The gays’ have been viewed as an exploitable market for at least a few decades now. Artists like Cher, Madonna and Kylie have long been famed for their fiercely loyal gay fanbase, so much so that every female pop star of a certain ilk has tried desperately to get in on the action. Then of course we have the straight-male-celeb-does-the-gays thing which has become an essential part of turning a b-lister into a profitable commodity. As I wrote here, “gay magazines still have an unhealthy affection for straight men who say they like gays while posing in their pants” and oh, it is ever so the case. With each progression of ‘the gays’ into a target market the concept has become more and more banal, more removed from the complicated taint of meaningful politics and messy humanity, more homogeneous and more offensive. We become a bunch of fabulous creatures who want nothing more than to be patronised. Patted on the head and told that we deserve to be treated like everyone else – not because of any crazy concepts like human rights, of course, but rather because gays are amazing and deserve good stuff. We’re now at the stage where any 2013 edition of ‘Marketing 101’ would have to feature an early section called ‘Patronise the gays’. It wouldn’t have to be a very long section, of course, as it would just have to lay down the buzzwords to use: homophobia, bullying, gay marriage, it gets better, love, equality etc. You don’t even have to make any attempt at subtlety – Class A, a truly dreadful boy band, released an equally dreadful single called ‘Pride’ and did a tour of British schools ostensibly to promote ‘pride’ and oppose homophobic bullying (in association with the ever-useless Stonewall). This has of course given them quick and extensive access to the market which is most important for any new boy band. It also renders them largely immune from criticism – as love of/support for the gays has become a totemic liberal value there are a multitude of voices who will defend such commercial exploitation of ‘homophobia’, invariably appealing to the mythical ‘young kid growing up and feeling alone’. The gay is always ‘out there’ in this equation, always a voiceless victim needing to be saved. Lady Gaga is obviously the standard-bearer for this conflation of homosexuality with victimhood, portraying herself as some brave freedom fighter bringing a voice to an oppressed minority. Only two weeks ago the rich white woman with the model boyfriend who attended “one of the most selective and expensive schools in Manhattan” declared that ”It’s time for us to be mainstream”. Gee, thanks for that Gaga. She is, to be fair, the perfect representative of an LGBT movement which is dominated by the concerns of privileged white men and is all-too-willing to allow itself be used as a mark of superiority by equally privileged liberals who fancy a taste of ‘the other’. That’s why the gay marketing ploy works so well. By buying into this idea that ‘gay rights’ exist in a vacuum, removed from any other political/geographical/human concerns, can completely ignore unpleasant issues of race, of poverty, of wider inequality (you can even ignore any discussion ofwhat ‘equality’ even means.) You don’t have to do anything at all other than say a couple of sentences and point people towards the e-petition. In essence you’re saying nothing that’s any more controversial than ‘I like cake’ yet your ‘support’ for the gays will be widely seized on by (at least) the gay media and will confer a fabulous sprinkling of radicalism on you. 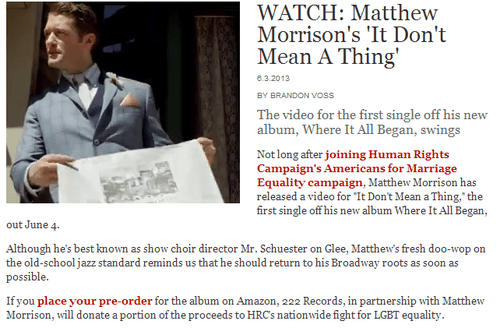 This completely unthreatening ploy sees the cause, and the gays, as instrumental to the real message – buy our product. So you find LGBT people celebrating the commercialisation not only of homophobia but of themselves. They become less than human, useful only for their victimised sexuality and perceived lack of voice. In this way this marketing ploy is as insidious and harmful as any ‘homophobia’ which it ostensibly aims to address (at least until the next single is out). We don’t need the Class A, Matthew Morrison and Saturdays of the world to promote their wares off the back of our ‘oppression’; more than that, we shouldn’t allow it. They can stuff their commercialised, profit-based, neutered and one-dimensional ‘Pride’.